Whilst studying, I was trying to think of ways to bring Anpu (He is the god I am currently researching in depth) into my life directly and use my own personal "gifts" to help others. I am a little apprehensive about it, but I have contacted a funerary home who may allow me to shadow some of the employees. If all goes well, there may be some opportunities for volunteer work after. It got me curious, does anyone else do work in their "mundane" life that they attribute to their parent deities or deities they worship? I always had a fascination with first responders (paramedics, firefighters & police), which lead me to go into law enforcement and investigations. I even did personal studies and gained certificates in the other two areas to have enough basic skills needed for several types of emergencies. This I attribute to my Father Heru in many ways! A lot of my hobbies are creative and/or art oriented, and that is my Mother Hethert's domain. I've been trying to branch out in this again and return to old hobbies I stopped (like music playing & composing). I also want to start a business for creative things. But when I think about all my interests or pursuits in general, they really do reflect my Parents well. So you are not alone in that! And I wish you the best of luck with the funeral home volunteering, I hope you get the position! This sounds like very interesting work to do, and I’m glad you have this opportunity at the funerary home. If you’re comfortable I hope you’ll share how it works out and if it brings you any insights to Netjer. I have long worked in feline rescue, preceding my association with the House, as a means to worship Mother Bast. I include Sekhmet in that now. And I think my long standing interest in a variety of ‘dead guys’, as an author and a scholar as well as a human person, may owe something to Sokar-Wesir as a Beloved. I’ll be interested to hear others’ experiences and thoughts on this! I presently run a business in which I make magical oils, incense, and powder; this is named for and dedicated to my Father Yinepu. 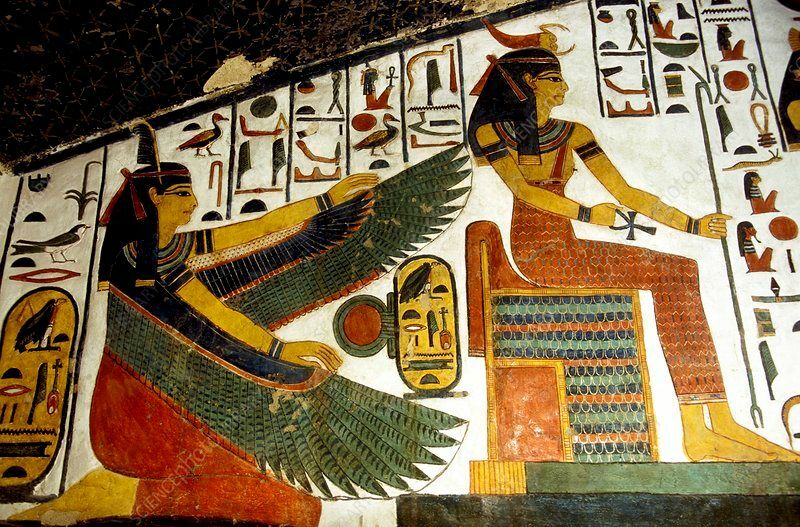 In the past I worked as an RN, way before I had begun working with Yinepu/Wepwawet, Heru Sa Aset, and Sekhmet...but as I learn more about Them, I see Their presence very prevalent in my practice. Not much in my professional life is related to my Father, Yinepu, though I almost did go into funerary work! However, I'm not too comfortable at being around the mourning, and am not sure how good I'd be at organizing funerals - I was more interested in the actual undertaker type work (cleaning and prepping bodies for burial), not the funeral direction, and since my home state is so small, I'd have to do both :c So that didn't happen. But! I do have a hobby that definitely is Dad-approved - I collect taxidermy! And once I'm in a more suitable apartment, or preferably a home of my own ownership, I intend to learn to preserve animals and skins myself! It may not be humans, but I'd say taxidermy is pretty Yinepu-influenced! Sorry for my lack of replies! Been a busy little bee indeed. I loved getting to read your responses. It really says a lot about this community that people try to live their life to honor the Netjer. One thing that made me shy away from Christianity was how some people could say they were doing things for their God (collect money) only for it to be used greedily. That's a topic of discussion for another day. Now, I might have reached a dead end. Yes, pun intended. The home never wrote me back so I am trying to find another way to contact them. They have a 24 hour line, but I am hesitant to call due to phone anxiousness. E-mail is my preferred method. Anxietealeaves.... boy do I love email. (Also have phone anxiety). In fact, I believe that's why I am a teacher. I can't directly relate any of the things I do to Dads. In my case, I believe is a more subtil influence, like I always try to find out something new and learn it by myself. The excpetion is Djehuty. Even before I know He is one of my beloveds, I used to work with languages and dedicate to Him. Things got intense, you know, and well.. He turned my attention to games and now I play like crazy, organize events and even study them: RPG, board games, online games. Yeah, I'm doomed. "The one belonging to two strong ones"
I'm currently unemployed and trying to find out what I wanna do. That said, I'm not sure whether my Fathers will influence it in any form. When I was in high school, I did very seriously contemplate joining the military. However, I was not Kemetic in any form back then. While I still feel that draw to militaristic jobs, I wouldn't be able to join the forces now for reasons I won't get into publicly. Even if I could, the current "president" being in office would lead me to refuse such a duty. I don't know if the draw to the military is Fathers influenced or what. Awibemhethert: I understand your pain, though it's nice to know I'm not the only one who has the phone anxiety. Tanakht: It's neat that you have such an introspective point of view. I'm going to try to practice that. Perhaps the Netjer have worked in ways I don't even realize, though Anpu was certainly the one who came to me first through my first in person guided meditation. 'Twas intense. Bawysudjawi: Perhaps it's not specifically the military, but rather you are being called to serve in some way? That's usually the first thing we think of when discussing the call to serve. I personally never saw too much of a connection between my Names and what I've done for work. I worked in the food industry, I've worked retail for many years, I did a short stint in flower delivery, and I am currently a human tissue processing technician. It was brought to my attention by a Yinepu kid (I believe?) that processing human tissues to be used in surgeries around the world is a pretty Yinepu thing to do. He's the Beloved I have that I least connect to directly, so this was a very pleasant surprise! In my non-working life, I do netjeri things and that aligns very well with the magical aspects of my Mom; particularly in the way many of them end up being protective of their human companions. This is a great topic! Thanks for bringing it up! This is a great thread. I love it. I haven't really done anything strictly related to my Father, but if I could I've always wanted to join the military. That would tie very well with my Father and my Beloved Set. I've also wanted to be apart of law enforcement, but sadly my medical/physical conditions prevent me from doing so. So I'm still looking on that front. Aside from that, I usually try to be a good person and do good things in my Father's name. For my Beloved Aset-Serqet, I am deeply involved with magical practice and, even though it's a completely different tradition, I still dedicate my Wiccan practice in Her name. That's what I associate with Her most strongly. I've thought about being a healer, but school is sadly too expensive for me to afford.